This medication is used to treat an overactive bladder. By relaxing the muscles in the bladder, fesoterodine improves your ability to control your urination. It helps to reduce leaking of urine, feelings of needing to urinate right away, and frequent trips to the bathroom. This medication belongs to the class of drugs known as antispasmodics. Read the Patient Information Leaflet provided by your pharmacist before you start using fesoterodine and each time you get a refill. If you have any questions regarding the information, consult your doctor or pharmacist. Take this medication by mouth, with or without food, usually once a day, or as directed by your doctor. Take each dose with a full glass of liquid. Do not crush or chew extended-release tablets. Doing so can release all of the drug at once, increasing the risk of side effects. Also, do not split the tablets unless they have a score line and your doctor or pharmacist tells you to do so. Swallow the whole or split tablet without crushing or chewing. Dosage is based on your medical condition, other medications you are taking, and response to treatment. Be sure to tell your doctor and pharmacist about all the products you use (including prescription drugs, nonprescription drugs, and herbal products). What conditions does Toviaz treat? Tell your doctor right away if any of these unlikely but serious side effects occur: constipation lasting 3 or more days, severe stomach/abdominal pain, trouble urinating, signs of kidney infection (such as burning/painful urination, lower back pain, fever). Seek immediate medical attention if any of these rare but serious side effects occur: fast heartbeat, fainting. List Toviaz side effects by likelihood and severity. Before taking fesoterodine, tell your doctor or pharmacist if you are allergic to it; or to tolterodine; or if you have any other allergies. This product may contain inactive ingredients, which can cause allergic reactions or other problems. Talk to your pharmacist for more details. This medication should not be used if you have certain medical conditions. Before using this medicine, consult your doctor or pharmacist if you have: problems emptying your bladder (urinary retention), severe blockage of stomach/intestines (gastric obstruction/retention). Before using this medication, tell your doctor or pharmacist your medical history, especially of: other bladder problems (such as bladder outflow obstruction, enlarged prostate), slowed movement of stomach/intestines, stomach/intestinal disease (such as ulcerative colitis), severe constipation, a certain eye condition (narrow-angle glaucoma), kidney disease, liver disease, a certain muscle disease (myasthenia gravis). Kidney function declines as you grow older. This medication is removed by the kidneys. Older adults may be more sensitive to the effects of this drug, especially dizziness, dry mouth, and constipation. It is not known whether this drug passes into breast milk and the effect on a nursing infant is unknown. Consult your doctor before breast-feeding. What should I know regarding pregnancy, nursing and administering Toviaz to children or the elderly? Some products that may interact with this drug include: pramlintide, potassium tablets/capsules, other drugs that can cause dry mouth and constipation (including anticholinergic medications such as atropine/scopolamine, antihistamines such as diphenhydramine, other antispasmodics including dicyclomine, belladonna alkaloids). Other medications can affect the removal of fesoterodine from your body, which may affect how fesoterodine works. Examples include certain azole antifungals (such as itraconazole, ketoconazole), among others. Tell your doctor or pharmacist if you also take drugs that cause drowsiness such as: certain antihistamines (such as diphenhydramine), anti-anxiety drugs (such as diazepam), anti-seizure drugs (such as phenobarbital), medicine for sleep (such as zolpidem), muscle relaxants, narcotic pain relievers (such as codeine), psychiatric medicines (including phenothiazines such as chlorpromazine or tricyclics such as amitriptyline). Check the labels on all your medicines (such as allergy, cough-and-cold products) because they may contain ingredients that can cause drowsiness, constipation or blurred vision. Ask your pharmacist about the safe use of those products. Does Toviaz interact with other medications? Should I avoid certain foods while taking Toviaz? If someone has overdosed and has serious symptoms such as passing out or trouble breathing, call 911. Otherwise, call a poison control center right away. US residents can call their local poison control center at 1-800-222-1222. Canada residents can call a provincial poison control center. Symptoms of overdose may include severe drowsiness or unconsciousness, unusual excitement, mental/mood changes. 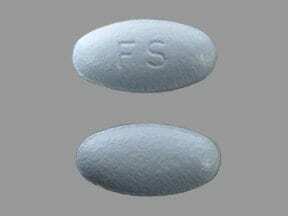 This medicine is a light blue, oval, film-coated, tablet imprinted with "FS". 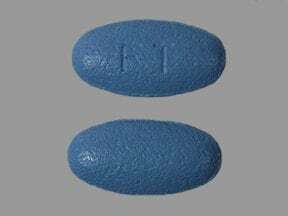 This medicine is a blue, oval, film-coated, tablet imprinted with "FT". Are you considering switching to Toviaz? How long have you been taking Toviaz?